LED light is different than halogen light. Some manufacturers may tell you that they are the equivalent to halogen. They are close, but they are not exactly the same. 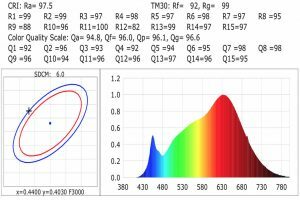 There are two main lighting characteristics that help define the quality and consistency of LED light. Color Rendering Index (CRI) describes how a light source makes the color of an object appear to human eyes and how well subtle variations in color shades are revealed. The CRI is a scale from 0 to 100 percent indicating how accurate a “given” light source is at rendering color when compared to a “reference” light source. The higher the CRI, the better the color rendering ability. Halogen is considered the “reference” light source and has a CRI of 100. CRI of 100 in an LED source has not yet been developed. CRI in the 90’s is possible but very expensive. Fluorescent lamp sources are considered very poor in CRI running in the low 70’s. A CRI index >80 is considered very good. KLM Series high-powered LED lamps have a CRI between 82 and 84. What exactly is CRI? According to the Lighting Research Center, “CRI (color rendering index), is the measurement of a light source’s ability to show object colors most naturally or realistically when compared to a reference/natural light source.” Or, more simply, CRI is simply a way to identify how well a light source will preserve the natural colors of an object or environment. CRI is rated on a scale from 0 to 100 and only Sunlight is classified as having a CRI of 100. Colors look exactly like they should underneath a light scoring CRI of 100. So the simple concept: the higher the CRI, the better colors will look and if the lower the CRI, the worse colors will look. 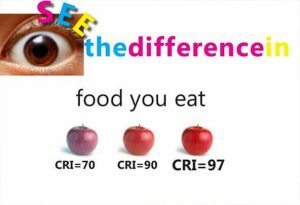 Let’s use the CRI variation of the apples shown to the above as an example. 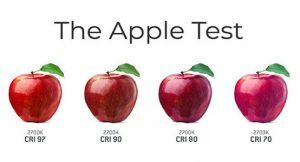 All of the apples are shown under a 2700K light (similar to Inspired LED’s Warm White LEDs), with the lowest CRI depicted on the right, and the highest CRI on the left. The scale for CRI is rated 1-100, with 100 being the highest and most “natural” looking light source, and 1 being the furthest from natural coloring. Just take a look at the CRI listing under each apple. In comparison to the apple on the left, the one on the far right appears dull, discolored, and certainly not very appetizing! Gradually as the CRI increases the apple begins to look more realistic; the shades of red become more and more pronounced until the apple looks picture perfect! 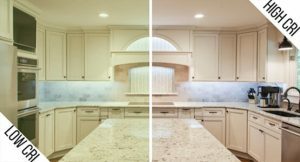 Kitchen CRI Of course, lighting CRI isn’t just important for food; this change in color can have a profound effect on the spaces within your home. Under low CRI lighting, objects like countertops, cabinets, shelving, and paint colors can appear dull, or may not match as well as they did in the store. It can mean the difference between crisp white cabinets, or a kitchen with a greenish hue. High CRI is also important when displaying or retailing products such as jewelry, art, or collectibles. 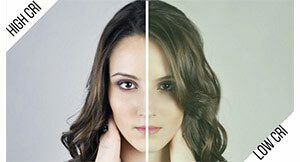 Lighting with poor CRI can even change the appearance of your skin tone (bathroom remodels beware!). 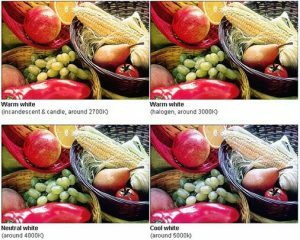 Because the appearance of all these items can be substantially altered by the CRI of a light, it is important to choose a good quality LED with a skin tone CRIhigh CRI rating. At KLM LIGHTING LED, we have long recognized the significance of CRI, and since opening our doors in 2009, we have been building our lights with 80+ CRI LEDs. Now, we are excited to announce that we have begun stocking and transitioning to 90+ or 97+ CRI products in order to provide the highest quality lighting to our customers! 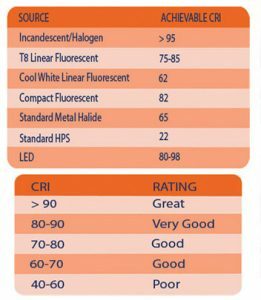 LEDs are available in the wide color temperature range from 2800K to 6500K as mentioned below. In a LED color temperature of around 2700K to 3300K gives same color tone (yellowish light) as conventional incandescent or halogen lamps. 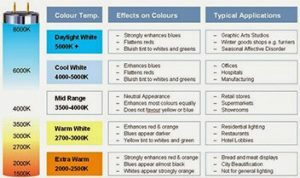 Some local companies do not describe color temperature specifications in Kelvin, but they simply label them with “Natural White” or “Office White”. Branded Companies always mention actual specifications so be sure that which color temperature you are selecting.